^ 4 of the electors pledged to Lincoln were elected since the Breckinridge and Bell electors finished behind all other candidates. ^ The Fusion vote used here is the vote for the high elector on the slate, who was pledged to Douglas. ^ The Fusion slate consisted of 3 electors pledged to Douglas, and 2 each to Breckinridge and Bell. Nonetheless, different electors appeared in some counties for Breckinridge and Bell, resulting in lower totals for them and a split electoral outcome. The 3 Douglas electors were elected and 4 of those pledged to Lincoln. The Breckinridge and Bell electors finished behind all other candidates. ^ The slate of electors were pledged to 3 different candidates: 18 to Douglas, 10 to Bell, and 7 to Breckinridge. ^ Not all of the Douglas supporters agreed to the Reading slate deal and established a separate Douglas only ticket. This slate comprised the 12 Douglas electoral candidates on the Reading ticket, and 15 additional Douglas supporters. This ticket was usually referred to as the Straight Douglas ticket. Thus 12 electoral candidates appeared on 2 tickets, Reading and Straight Douglas. ^ This vote is listed under the Fusion column, not the Breckinridge column as many other sources do, because this ticket was pledged to either of two candidates based on the national result. Additionally, the slate was almost equally divided between the supporters of Breckinridge and Douglas. ^ The Democratic Party chose its slate of electors before the National Convention in Charleston, SC. Since this was decided before the party split, both Douglas supporters and Breckinridge supporters claimed the right for their man to be considered the party candidate and the support of the electoral slate. Eventually, the state party worked out an agreement: if either candidate could win the national election with Pennsylvania's electoral vote, then all her electoral votes would go to that candidate. Of the 27 electoral candidates, 15 were Breckinridge supporters; the remaining 12 were for Douglas. This was often referred to as the Reading electoral slate, because it was in that city that the state party chose it. ^ The Douglas ticket in Rhode Island was supported by Breckinridge and Bell supporters. Holt, Michael F. (1978). 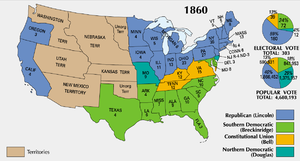 The Political Crisis of the 1850s. Luebke, Frederick C. (1971). Ethnic Voters and the Election of Lincoln. Potter, David (1976). Impending Crisis 1848–1861. ISBN 0-06-090524-7.